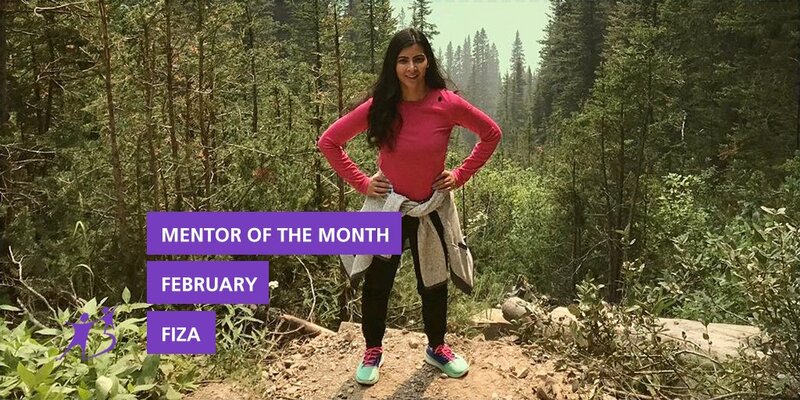 Big Brothers Big Sisters of Waterloo Region is proud to announce Fiza as our February Mentor of the Month! Fiza is a Human Resources professional who loves adventure! Having been to over 16 countries so far, it’s safe to say that she loves to travel! When she isn’t touring the world you can find Fiza reading, hiking, doing yoga, boxing, or something to do with her passion for animals! Fiza has been a volunteer with our Big Bunch program for over two years now and has an incredible personality that our Littles love to be around. Fiza was moved to become a volunteer with Big Brothers Big Sisters of Waterloo Region after picking up volunteer experience across numerous organizations. “The thing that really moved me to become a part of BBBSWR was seeing how big of an impact a Mentor can make on somebody’s life.” Through a shared experience, she decided that taking a step to becoming a Mentor was another adventure that she could be a part of, and this one would benefit a child’s life. “A friend of mine told me about how she had a Mentor through a Big Brothers Big Sisters program when she was younger and how it was a life-changing experience for her. It’s been ten years, and to this day, she talks about her Big Sister with such fondness. It made me want to be a part of something like that.” The team at BBBSWR aren’t the only people that are grateful that Fiza decided to take this step after hearing about her friend’s relationship with her Big Sister; the Little’s in her Big Bunch program are incredibly happy to have her as a Mentor as well. We asked Fiza: “What does Mentoring mean to you?”; and her answer was perfect. Fiza’s favourite part about this adventure is getting to feel like a kid again. On an average day, her Big Bunch group will do anything from playing games like dodgeball, basketball, or soccer, to arts and crafts, to just hanging out and communicating about things like school, friends, and home life. While the physical activity can be crucial to the growth of young minds, the communication and interpersonal skills these children nurture and develop in the program can be even more valuable in their lives. “It’s fun to just play and hang out with the Littles, but at the same time, you are really there for the kids who need a Mentor to teach them and help them with new things. Someone who can give them advice or listen, someone who has their best interest in mind. Seeing the Littles interacting is a highlight of my week.” It’s not always the same with her Big Bunch group through. “My favourite memory with my Littles would be driving in the car and singing One Direction songs at the top of our lungs.” That does sound like fun, Fiza! Being a big advocate for the impact that the Big Brothers Big Sisters mentorship programs have on the lives of youth, we asked Fiza about the impact she sees on her Littles. “The impact I’ve seen in some of the Littles that I’ve Mentored is huge. They’ve become considerate of others, more self-confident, they’re better listeners, and more in touch with themselves. It makes me really happy to realize that I’m a part of that.” It’s not only that the Littles that she’s Mentored that have benefitted from the programs. Fiza told us that she’s also learned patience, spontaneity, acceptance, and adaptability; just to name a few! We’re incredibly grateful for everything she puts into her volunteer work with us, and we’re proud to be able to give back to her as well.